Twenty choices will bring contentment when the world says a person isn't good enough, closeness born of relationship with God, and peace in times of trial. These choices were made by Daniel, a young Jewish man serving God in a godless society, revered by God, and saved from lions. Twenty choices will bring contentment when the world says you aren’t enough, closeness born of relationship with God, boldness to share the truth, and peace in times of trial. These choices were made by Daniel, a young Jewish man serving God in a godless society, revered by God, saved from lions. The Daniel Key will lead you to a life-changing faith. The 20 choices will bring you contentment when the world says you are not enough, closeness born of a relationship with God, boldness to share the truth, and peace in times of trial. 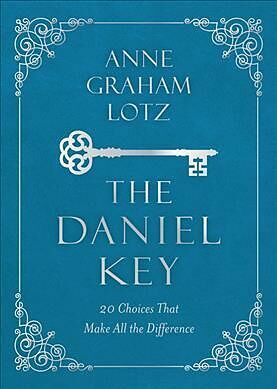 The Daniel Key will lead you to a life-changing faith.